Regular readers will not be surprised to hear me say the Tigers rotation is exceptional and many of you have probably seen Dave Cameron’s take from a few weeks ago on the same subject. His point, which is the one I’ll pick up here, is that when we adjust Fielding Independent Pitching (FIP) for ballpark effects and league average, the Tigers have the best rotation ever, no hyperbole added. Those adjustments will look like this: League average FIP- is 100 and every point above or below average is a percent better. Pitchers want the lowest FIP- possible. The current record for FIP- belongs to the 1971 White Sox at 77 with a handful of other clubs packing around 77-79. The 2013 Tigers are setting the pace, however, at 64. Consider what that means. The best rotation of all time was 23% better than league average. 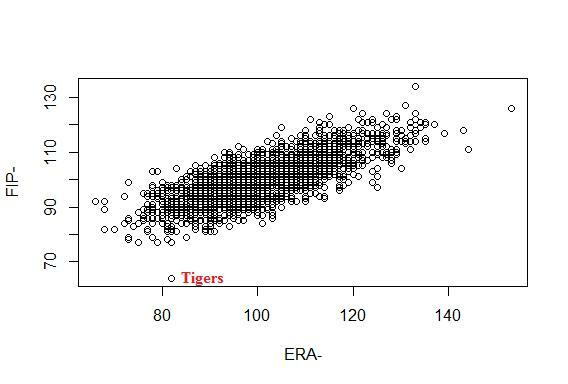 The Tigers rotation is 36% better than league average. Certainly, the season isn’t even half over and there is time for the Tigers to cough this up, but they have a pretty big cushion. They’re getting contributions from all five starters who all have a FIP below 3.50 and all have xFIPs at 3.20 or below. More amazingly, the strikeout rate is off the charts. We have to acknowledge that this is a high strikeout era, but the Tigers current K/9 from the starting rotation is 9.51. The MLB record is 8.62 from the 2003 Cubs. The Tigers have a K:BB ratio of 4.46. The MLB record is 4.22 from the 2011 Phillies. The Tigers rotation leads baseball in K/9 by a ton, is 3rd in BB/9, and 2nd in HR/9. They’re essentially dominating hitters in a way that we’ve never seen before. Currently, they’ve accumulated 13.2 WAR, which is 3.3 wins more than the 2nd place Cardinals and they are nearly halfway to the record set by the 1970 Cubs (29.4). It’s a rotation on an historic pace. If we plot FIP- and ERA- (which is the same principle comparing to league average) it just looks silly. This is every starting rotation in MLB history, including the other 2013 rotations who are already regressing to the mean. One would except the Tigers to regress toward the line that obvious runs through this plot, but it’s not entirely clear in which direction they will move. FIP and xFIP are more predictive than ERA, so you would expect that they would move left on the graph before they moved up, but that seems equally ridiculous given a subpar defense and the fact that an ERA- that low would also be silly. I’ve written before about how the Tigers as a team are throwing more changeups and how Scherzer, Porcello, and Sanchez have all made leaps into the upper echelons of MLB starters. This is a truly remarkable rotation that Dave Dombrowski has assembled. Most teams would kill for their worst starter. Their fourth best starter would be the ace on almost every team this season. They have the 4th, 6th, 8th, and 11th best pitchers by WAR this season. They have the 2nd, 7th, 8th, and 12th best starters by FIP and the five Tigers starters are 4th, 6th, 7th, 8th, and 16th best pitchers by xFIP in MLB right now. If you sort AL starters by xFIP all five Tigers starters are in the top 10. Three of the top four AL starters in K/9 are Tigers. Justin Verlander has the Tigers worst BB/9. Justin Verlander. The American League All-Star staff should just be the Tigers five starters. This is, perhaps, the most incredible rotation we’ve ever seen. If you look at the individuals starters and how they compare to their peers you certainly have to wonder where the Tigers rank all-time. As it turns out, they rank quite well. By strikeouts, walks, and homeruns allowed, the three categories that build FIP, pitchers have complete control over, and generally predict future performance, the 2013 Tigers are not just the best rotation we’ve ever seen, it’s not really even that close. With 95 games to play, the Tigers staff is working on a season for the ages.